It was time not for a movie but an opera at the local bijou, in this case last Saturday’s Metropolitan Opera’s live presentation of Kaija Saariaho’s L’Amour de loin (Love from Afar) at Cineplex’s Devonshire Mall theatres, though the opera was simultaneously broadcast at numerous locations in metro Detroit and around the world. Hard to believe but this was the first opera the Met has presented since 1903 that was written by a female composer. (The libretto was by novelist Amin Maalouf.) Unlike most operas L’amour de loin was very sparse in terms of characters and chorus, though the chorus - their heads anyway - did emerge from time to time from a set that evoked the sea. Otherwise, the performance was just three characters who kept it going through five acts. And, boy, did they did it extremely well. The story, based on original manuscripts, is about a poet who longs for an ideal lover but she is located far across the sea. Eric Owens (bass-baritone) plays the poet Jaufré, Susanna Phillips (soprano) is the idealized Clémence, and Tamara Mumford (mezzo-soprano) is The Pilgrim who brings the two lovers together. The minimalist production features a series of LED strings of lights representing the sea's waves. The lights change color or go dark, representing, remarkably well, day and night or calm and rough waters. The Pilgrim, an almost androgynous character (as Mumford herself described the role in an interview), links the lovers by sailing back and forth between them. Meanwhile, Jaufré and Clémence, in separate scenes, are perched atop some type of ship deck, or bridge or wharf-like platform that also looks like a structure out of science fiction. The chorus adds critical elements to the story as does Saariaho’s surreal score, conducted by Susanna Mälkki. But it really is all Phillips, Mumford and Owens, whose singing is meditative and full of longing. At first I thought the set too stark but afterwards appreciated it as a suitable backdrop to the characters’ loneliness in an almost otherworldly environment. I always kick myself for forgetting that if there is one movie theatre that is packed for weekend matinees. It’s the Maple in Birmingham. Such was the case yesterday when we showed up for the early afternoon screening of Kenneth Lonergan’s Manchester by the Sea, starring Casey Affleck and Michelle Williams. Normally, a weekend matinee at most theatres not only means there are plenty of seats available but a discounted ticket as well. While the Maple offers discounts it’s hard to find seats, especially if you come at the last moment or a few minutes late, as was our case. (I’ll blame the delay on a road accident on Telegraph.) The reason? It’s those discounts. For some reason people simply LOVE saving a few bucks by attending matinee screenings at this theatre. It has always been the case even when the Maple was run by Landmark Cinemas. (BTW, we got ticket refunds after deciding the crowded theatre was too much for us. ).....Not that I had an overriding interest in seeing the film, a story about family and community in a small Massachusetts town. But it’s the only film screening right now that seems half-interesting. The film has won major acclaim, however, and scores an astounding 97 per cent on Rotten Tomatoes. So, what do I know? Just make sure to come early to a Maple matinee. Recently, in Germany, I caught Jim Jarmusch’s Paterson. In the small city where I was visiting, the film was only a few that were screened in the original English with German subtitles. Even most North American independents, as well as films generally, seem to be dubbed in countries like Germany and France. The film itself was a low key if mildly humorous look at a couple – he (Adam Driver) a bus driver and poet, she (Golshifteh Farahani), an off-the-wall designer – who live out their day to day lives in the New Jersey city near New York. The film plays on the circularity of life and the connections between the artistic present and past. For example, Allen Ginsberg, William Carlos Williams, Lou Costello and Rubin “Hurricane” Carter all hailed from Paterson…..But it wasn’t so much the film but the theatre's atmosphere that impressed. 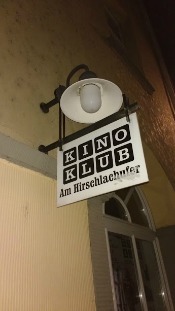 The Kino Klub in Erfurt (photo above) was a small shoebox of an arthouse with perhaps 100 seats. It reminded me of the old Windsor Film Theatre on Wyandotte Street. But it was attractively designed with a connected bar and lounge. And unlike in North America, when the doors opened the patrons simply wandered in with whatever adult beverage they had on hand - bottles of beer, glasses of wine - as casually as if it was Coca Cola. Ah, Germany! Another thing: I attended a cinema in Paris to watch I, Daniel Blake (which won this year's Palme d'Or at Cannes), British director Ken Loach's latest. If you think advertising before a feature presentation in a North American theatre is long, you haven't seen anything. In France, it seems virtually endless.